Stale Gum: Why is Joe DiMaggio Holding His Junk? Couldn't UD have come up with more dignified picture? 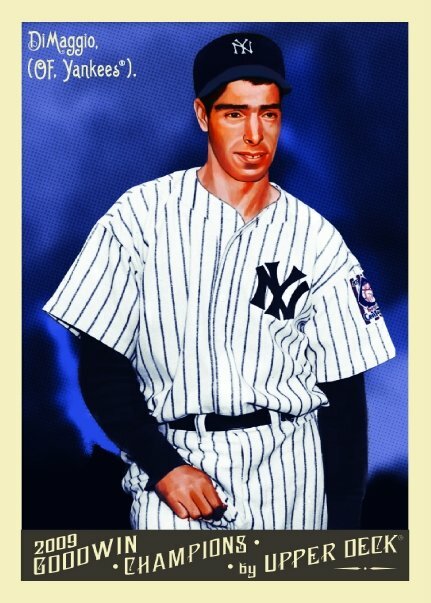 I mean, it's Joe DiMaggio for crying out loud. Show some respect. a - you are right. They shouldn't have Joe D picking at his crotch. b - The buck teeth look horrible, too. Q: Why is Joe DiMaggio Holding His Junk? A: Because no one else could? He's not, the image is supposed to reflect him tugging his pant leg back because he's raised his right leg (slightly) as if he were resting his foot on a step. Having said that, there were thousands of other images that could have been created so that Joe D. didn't look like he was playing pocket pool. I don't think UD thought their cunning plan through... That 'artist' is probably thinking "ha-ha!" as he hits the ATM.